Clarke was capped 31 times by New Zealand during an 8-year international career spanning 1956-64. A big man, his fame was built around his superb goal-kicking success that earned him legendary status and also the nickname 'The Boot'. He made his provincial bow with Waikato as a 17-year-old and helped them win the Ranfurly Shield in 1951. 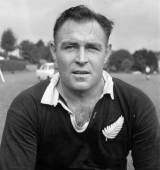 He later starred in Waikato's historic 14-10 victory over South Africa in 1956 which led to his international bow in the third Test against the Springboks in Auckland. Clarke also kicked a record six penalty goals to cancel out the Lions' four tries in famous 18-17 victory in their clash in Dunedin in 1959. An old-style toe-kicker, his kicking exploits also included a touchline conversion in gale-force winds against France in Wellington in 1961 and a monster 65-yard goal from a mark to clinch a 9-6 victory over England in 1963. Sir Wilson Whineray, who captained Clarke in all but six of his 31 Tests, once said of his team-mate. "On the field he was like a huge energy force behind you. Even when he missed a kick, it could have a devastating effect on the opposition. He could kick them from his own 10-yard line, and we'd find opposition hookers were afraid to move, and that loose forwards would stay attached to scrums. He inhibited the whole opposition." He scored a total of 781 points for the All Blacks (207 in Test matches) which was a record that stood for 24 years until his mark was eclipsed by Grant Fox in 1988. Clarke had four brothers, fellow All Black Ian, first-class cricketer Douglas, Brian and Graeme, all of whom also represented Waikato but they appeared together just once at Te Aroha in 1961. Clarke also played 27 first-class cricket matches for Auckland and Northern Districts but it was his brother Douglas who went on to claim international honours with the Black Caps. Clarke emigrated to South Africa in the 1970s and rarely returned to his native country after establishing a tree-felling business. He was seriously injured in a car accident in 1997 and was diagnosed with melanoma in March 2001. He died in Johannesburg on December 29, 2002.